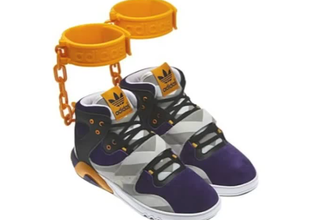 LOS ANGELES - Only a few days after revealing a bizarre sneaker online, Adidas has decided to squelch the design that some people have labeled as racist and insensitive to slavery. Adidas posted a Facebook photo of the JS Roundhouse Mids, a shoe that comes with a plastic shackle attached to it. The company tried to market the shoe as a trendy design that it’s wearer would not want to remove. “Got a sneaker game so hot you lock your kicks to your ankles?” Adidas asked on its Facebook post. But the only game some online viewers saw was an unnecessary toying with slavery, which led Adidas to cancel the shoe’s August release. The sneaker’s designer is Jeremy Scott, who has been known for turning his unconventional ideas into unique products. Scott, who is white, has indicated that the design is based on the My Pet Monster series of children's toys. But that has upset some people who view the shackles as a reference to African-American slavery. Others defended Scott and his design and called the outrage unfounded and shortsighted. The Rev. Jesse Jackson and the Rainbow PUSH Coalition released a statement condemning Adidas for releasing the design. “The attempt to commercialize and make popular more than 200 years of human degradation, where blacks were considered three-fifths human by our Constitution is offensive, appalling and insensitive. Removing the chains from our ankles and placing them on our shoes is no progress," Jackson said. "For Adidas to promote the athleticism and contributions of a variety of African-American sports legends — especially Olympic heroes Wilma Rudolph and Jesse Owens and boxing great Muhammad Ali — and then allow such a degrading symbol of African-American history to pass through its corporate channels and move toward actual production and advertisement, is insensitive and corporately irresponsible." The social media firestorm led Adidas to pull the shoe Monday night. "The design of the JS Roundhouse Mid is nothing more than the designer Jeremy Scott's outrageous and unique take on fashion and has nothing to do with slavery,” Adidas said in a statement. “Since the shoe debuted on our Facebook page ahead of its market release in August, Adidas has received both favorable and critical feedback. We apologize if people are offended by the design and we are withdrawing our plans to make them available in the marketplace."